1) "A Small, Untroubled World: The Art of Gustave Baumann" (1881-1971). Born in Germany but raised in the US, he worked in the engraving business while he studied at the Art Institute of Chicago. 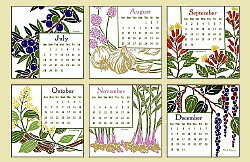 He returned to Germany to study in Munich during a period of innovative block printing. 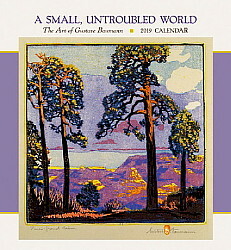 In 1918 he became a member of the Santa Fe New Mexico Artist's community. He practiced block printing for 50 years. 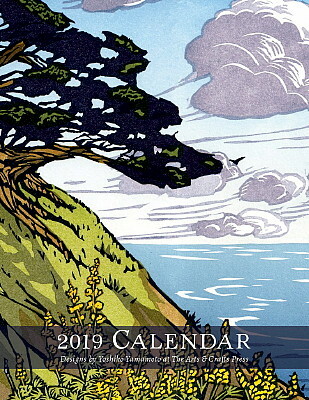 Published by Pomegranate for the New Mexico Museum of Art, this calendar presents twelve of Baumann�s brilliant meticulously crafted woodcuts. 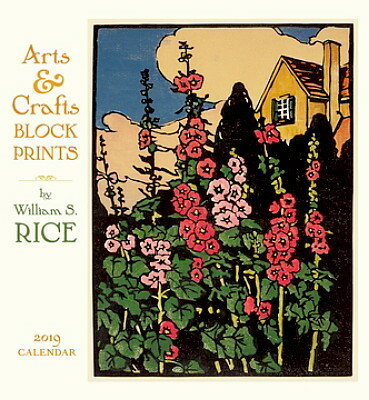 2) "Arts & Crafts Block Prints by William S Rice" Artist, craftsman, teacher and author William S Rice (American 1873-1963) traveled to California in 1900 to teach in the Stockton public schools. He traveled, sketched and panted throughout the state and in 1910 he moved to San Francisco. He worked in several mediums but ultimately favored block printing. He designed, carved and printed the prints himself. 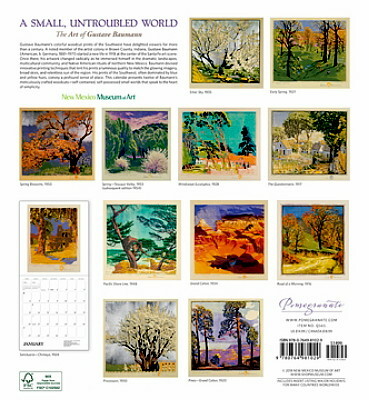 His prints are now in many museums and collections worldwide. 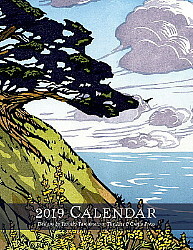 3) "2019 Wall Calendar - Designs by Yoshiko Yamamoto at The Arts & Crafts Press" is offset press printed in Washington State and features 12 favorite notecard and block print designs both new and old. 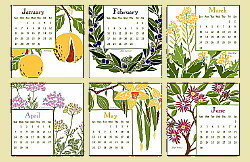 Brighten the days of your year with nature designs by Yoshiko Yamamoto. 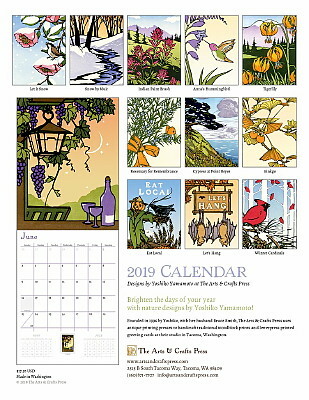 4) "2019 Desktop Calendar by The Arts & Crafts Press" Featuring 12 spice images adapted from Yoshiko Yamamoto's designs to brighten your desk year-round! 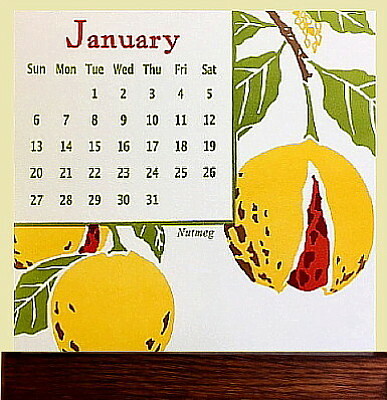 Printed on sumptuous 100%-cotton cardstock �Crane�s Lettra�, an ideal paper for printing with crisp deep impressions. Only 750 copies were printed using a 1940's Vanderbook printing press at their studio in Tacoma, Washington. Our friends at Dard Hunter Studios in Ohio handpicked white oak and made our simple, elegant oak stands. 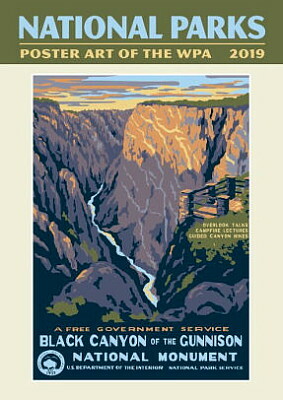 5) "NATIONAL PARKS - POSTER ART OF THE WPA 2019" by Ziga Media featuring the Images� of Ranger Doug's Enterprises. For 35 years the WPA-era posters promoting the National Parks has disappeared into history. But in 1973 a Grand Teton poster turned up in a park burn-pile and it piques the interest of seasonal park Ranger Doug Lean. A 20 year effort led him to Harpers Ferry WV where 13 black & white negatives survived in file drawers of the National Park Service. As Ranger Doug began a republication project, originals began to resurface like 2 Mt Rainier posters in a garage near Seattle. So then the National Park Service started searching their flat-file archives yiedling additional originals. 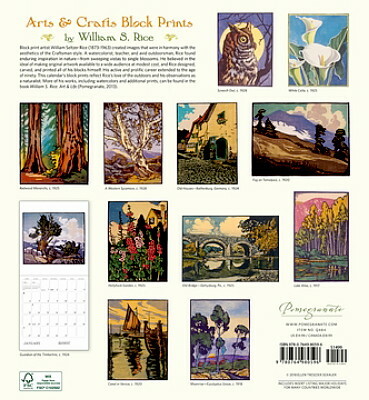 In 2004 a cache of 9 originals were found in Los Angeles and they were sold at auction. 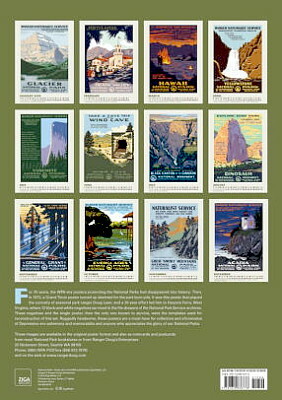 Today 41 originals have been found and to date Ranger Doug has remastered 40 park posters.